Do you know the positive impacts that a leading furniture Enterprise Resource Planning solution can have on your furniture retail business? Ready to learn more? Download our White Paper and start to "Gain the Greatest ROI From Your ERP Software." Ready to Get More Out of Your Software? 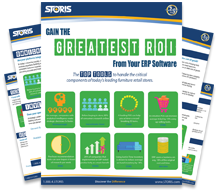 Download "Gain the Greatest ROI from Your ERP Software"